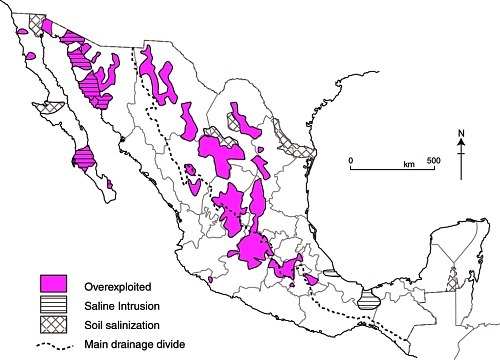 Mexico’s groundwater aquifers are a very important resource. About 64% of public water supplies come from wells sunk into aquifers. Mexico City, Monterrey and several other metropolitan areas rely heavily on aquifers. Aquifers also provide about one-third of all the water for agriculture and livestock. The largest aquifer resource in terms of renewable water availability is in the Yucatán Peninsula, with about a third of the national total. A large portion of the rainfall in the Yucatán seeps into its aquifers; there are virtually no rivers to carry rainwater to the ocean. The states of Chiapas and Tabasco, where rainfall is the heaviest, account for about a quarter of Mexico’s aquifer resource. The next largest sources are the Balsas and Lerma–Santiago basins but each holds less than a tenth of the national total. According to the National Water Commission, 104 of the country’s 653 identified aquifers are overexploited in that more water is withdrawn each year than is naturally replaced. The velocity of water movements underground can be astonishingly slow; it may take rainwater water tens or even hundreds of years to reach the aquifer it is replenishing. (For a curious case of replenishment rates, see The Enchanted Lake). The number of overused aquifers has increased rapidly in recent decades from 32 in 1972, to 80 in 1985, and 104 in 2004. When coastal aquifers are over-exploited, seawater seeps in to replenish the aquifer, and eventually the aquifer can become too salty to be used for irrigation. Salt-water intrusion is a significant problem for 17 aquifers located in Baja California, Baja California Sur, Colima, Sonora and Veracruz (see map). Nearly 60% of the total groundwater extracted is withdrawn from overexploited aquifers. As expected, the over-exploited aquifers are in the heaviest populated and the most arid areas. Total water extraction exceeds recharge in Mexico City, Monterrey and other large northern metropolitan areas as well as irrigated areas of Sonora, the central northern plateau, the Lerma basin and Baja California.